Hubungan antara sel efficacy dengan penyesuaian diri akademik pada siswa SMP program akselerasi. Studi pada sekolah X.
Arief, Jennifer (2007) Hubungan antara sel efficacy dengan penyesuaian diri akademik pada siswa SMP program akselerasi. Studi pada sekolah X. Skripsi thesis, Universitas Tarumanagara. 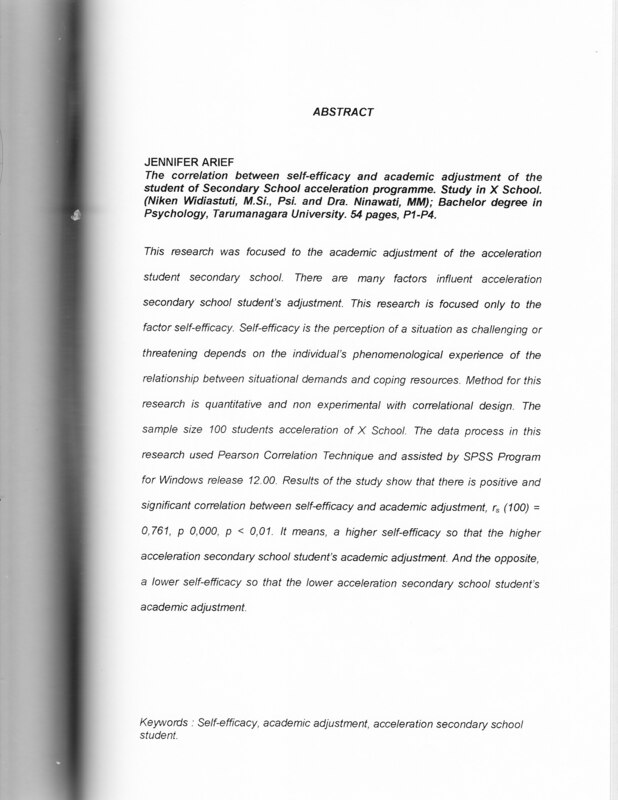 This research was focused to the academic adjustment of the acceleration student secondary school. There are many factors influent acceleration secondary school student's adjustment. This research is focused only to the factor self-efficacy. Self-efficacy is the perception of a situation as challenging or threatening depends on the individual's phenomenological experience of the relationship between situational demands and coping resources. Method for this research is quantitative and non experimental with correlational design. The sample size 100 students acceleration of X School. The data process in this research used Pearson Correlation Technique and assisted by SPSS Program for Windows release 12.00. Results of the study show that there is positive and significant correlation between self-efficacy and academic adjustment, r, (100) = 0,761, p 0,000, p < 0,01. It means, a higher self-efficacy so that the higher acceleration secondary school student's academic adjustment. And the opposite, a lower self-efficacy so that the lower acceleration secondary school student's academic adjustment.